It's clear that Ghosts doesn't posit a world worth saving. You saw a lot of the squad's dog in advertising more than any other character because Riley was the only likable squad mate. There's no attempt to show the world before the catastrophe either. Apart from an early walk down a suburban street, there's nothing in Ghosts that states this world deserves to survive. The characters range from bland, to mute, to highly questionable ethically, and have almost no chemistry as a family unit. Indeed, the father's maniacal vision to make his sons soldiers paired with your brother Hesh's constant orders make the central family dynamic look dysfunctional. By the end of the game, the protagonist Logan feels like a little brother pushed around by everyone, even to the point that Hesh orders artillery on their position without asking Logan whether he's okay with, you know, committing suicide. There's no kindness here, no humanity or emotional investment. 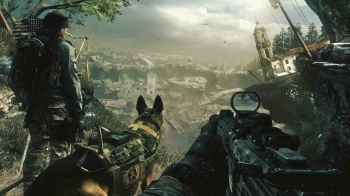 In Ghosts you're fighting to win the war, with no idea why. Ghosts shatters the world for no explicable reason then gives you no reason to put it back together. And that began with its rushed prologue. Which isn't to say a pre-apocalypse prologue can't work. The Last of Us nailed it. By the end you know everything necessary to understand these characters and their world. Joel once had a daughter he cared about and was willing to work hard for. They weren't happy so much as they were loving. But that was taken from him by human selfishness and panic, (after all, it's not the infected that kill his daughter). This blow creates a man who can't love in that way again - or so he thinks. There are little human moments that give us hope, from Bill's unexpected depths to Tess' self-sacrifice. 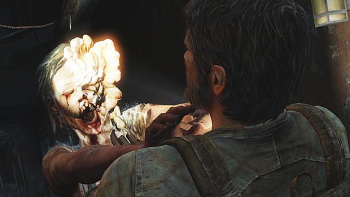 And The Last of Us ultimately shows Joel can be a loving caretaker again, that this humanity still exists beneath the calluses and greediness. It shows us there's something worth preserving. The tragedy, of course, is that Joel's final decision sacrifices everyone else to preserve his new humanity. It's an ironic twist that suggests even love, selfish love, will doom humanity via our inability to think beyond ourselves. As a hero, he's unequal to his role in world affairs - yet there's that glimmer in Ellie's eye, the suggestion that she knows. Hope springs eternal. The pattern doesn't have to be highbrow either. Sunset Overdrive conforms to the structure without either Advanced Warfare's political dimension or The Last of Us' philosophy, but still it gets its point across. Sunset City falls due to our inability to question what we put in our bodies. While FizzCo's responsible as well, the public brought the disaster on through unquestioning acceptance of a company that's clearly, cartoonishly evil. The game even drives this point home further by building itself around its characters continuing to put weird, untested chemicals into their bodies in the form of amps. The comedic twist here is that this same stupid haplessness and love for consumption is what makes the characters feel likable and worthy of being spared. Thrown into the apocalypse, they dub it the awesomepocalypse and go about piecing their old favorite objects together and acquiring new toys. Faced with consumerism destroying society, they take refuge in, of course, consumerism. The main character holes up in her apartment until the beer runs out. A preppie must have his bottled water. Sunset Overdrive exists in the screwball comedy genre, where characters dig themselves deeper for our amusement. Any successes they achieve come in spite of - or as a result of - their stupidity and heroic delusions. That's why we like them. Sunset City doesn't really deserve to be saved, but these characters do - for their idiot optimism if nothing else. Apocalypse stories have been around since humanity gained enough introspection to realize we won't be around forever. It's a resonant theme game developers can and should continue to play on, but when they do so it's good to remember what makes these stories attractive in the first place. To craft an apocalypse, you have to show your work. Show us a world that's broken before it ever falls apart. Show us a world that deserves fixing, even if the characters don't have the power to patch it up themselves. Show us the way the world ends, but when that moment arrives, you need to earn it.